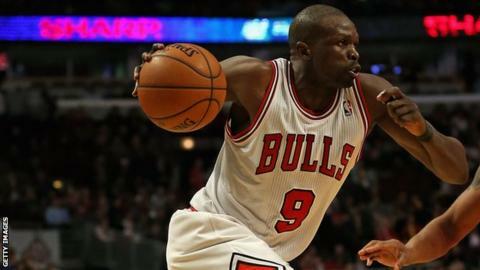 British basketball star Luol Deng has been picked for the NBA's annual All-Star Game for the second year in a row. The 27-year-old made history in 2012 when he became the first Briton to play in the prestigious event. The Chicago Bulls forward was named for the Eastern Conference following a poll of the league's coaches. The Eastern Conference v Western Conference game takes place in Houston on 17 February. Deng featured for just six minutes as a substitute in the 2012 All-Star Game when he sustained a wrist injury. Despite his brief appearance, Sudan-born Deng risked a fine for wearing an unsanctioned T-shirt showing a map of the African continent. He recovered from the wrist injury to feature at London 2012, where Team GB beat China 90-58 in their final group stage match to record their first Olympic win since 1948.